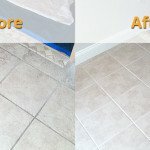 Fresh Tile Cleaners follow a four-step cleaning procedure to achieve spotless tiles! Here is the detail so that you know what to expect from us. First of all, our cleaners will figure out which type of floor/stone is there at your home/office. 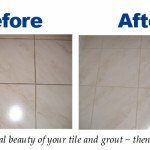 This helps them define the best procedure and cleaning solution for tile and grout cleaning and floor restoration. 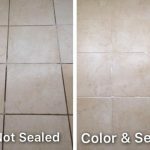 Next, they apply the most appropriate cleaning solution on tiles and grout that go deep within the tiles and grout surface to get rid of all stains from the floors. All our cleaning solutions are eco-friendly and have no harm on kids and pets. After this, your tiles will be properly scrubbed. Then our cleaners will use a rotor brush tool along with pressured hot water to break down soil, oil and dirt from the tiles. All of this is extracted using a strong vacuum that leaves nothing but gleaming tiles behind. Lastly, this vacuum system is used to dry your tiles.